Please read everything we send you. !Rates and Policies are subject to change and vary during holidays, and special events. All rooms are double occupancy only. Less than 7 days before arrival: No fee but, you must take responsibility for the cost of your entire reservation. If booking through a Third Party (Booking.com, Expedia, etc.) your card will be charged on this day. Less than 21 days before arrival: No fee but, you must take responsibility for the cost of your entire reservation. *If we can re-book the room(s) night(s) a partial refund less cancellation fees will be made. Payment: We accept a valid Visa or MasterCard to hold a reservation. Your credit card will be charged 7 days prior to your arrival, when you take responsibility for the cost of your entire reservation. 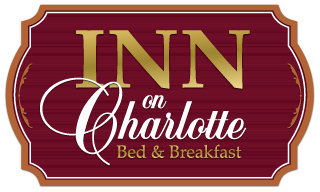 We only accept Gift Certificates that are purchased from The INN On Charlotte. We do not participate in any gift card program, including bedandbreakfast.com's. Check-in: 3:00 PM - 6:00 PM. Check-out: 11:00 AM. Arriving early? Your room will be ready after 3:00 but, your parking may be ready around 12 noon. So get parked in your assigned spot (we send you parking information via email.) and go have some fun. We will see you after 3:00 to check-in. Arriving later? You must call to arrange a late check-in with the Innkeeper, and parking can not be assured. Quiet-time We reserve 10:00 pm – 9:00 am as quiet time at the inn. No food can be brought into the inn, including pizza deliveries. No parties and no non-registered guests allowed. We reserve 9:00 pm – 9:00am as 'quiet time' at the inn. $75.00 plus any additional costs as necessary. A $0.00 deposit is collected at the time of purchase. Payment for gift certificates is collected at the time of purchase.